Why has it been so long since I ventured up to my little brother’s garage for some Dodge time? Well, first I got so sick with a cold that I spent days in bed. 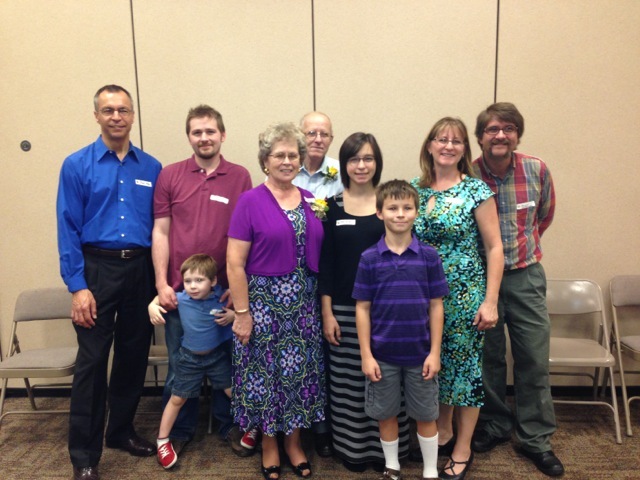 Then I was busy, along with my brothers, putting on a 50th Wedding Anniversary party for our parents. Yep, Doug and Char celebrated 50 years of marriage on September 14th. Congratulations Mom and Dad! My brothers and I are all pretty glad Mom and Dad got married because, well, we’re here having fun with our family and the Dodge because of it. The Family with Mom and Dad at the center. Uncle Marvin, our uncle who sold the Dodge to us, was there along with our Aunt Elaine. 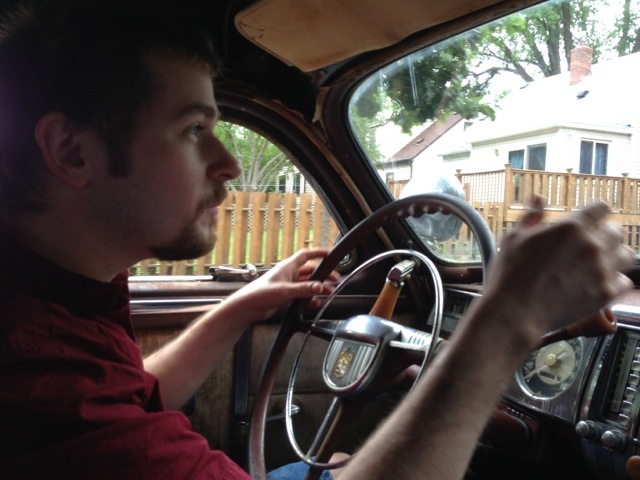 Uncle Marvin is now following the 1947 Dodge Blog and seems pretty happy with the fact that Joel has the Dodge running. Our 92-year-old Great Uncle Myrl, our Grandpa Anderson’s only living sibling, was there in fine form. If I understand the story correctly, Uncle Myrl is the one who suggested that our Grandpa buy the Dodge from their brother, Elmer. Mom’s Cousin Renny was there. Cousin Renny is the son of Uncle Elmer, the first owner of the Dodge. Renny actually drove the Dodge a few times way back when. Joel and Renny had fun talking Dodge at the party. Okay, back to today. Why was today so special? Well, Joel took me for a ride in the Dodge! It’s my first ever ride in it and only the third time Joel has driven her around. 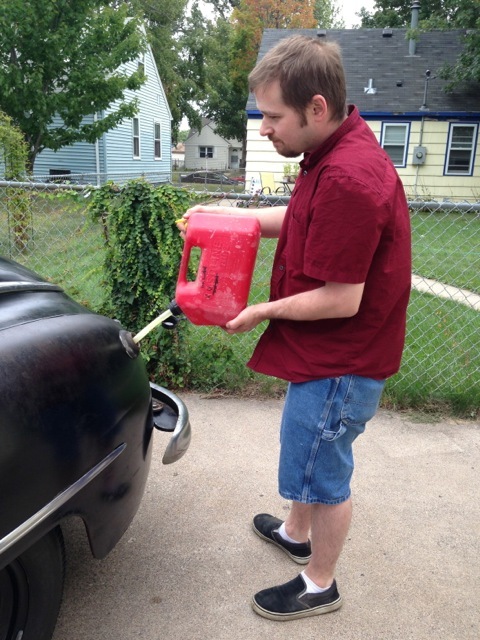 Joel putting gas in the Dodge. I think we’ll need to actually fill her up someday. Two gallons at a time won’t get us very far. Then we drove Joel’s Passat to the gas station for 2 gallons of gas. Then back to Joel’s to pour the gas in the Dodge. And we tried again. And we had fun! We drove around Joel’s neighborhood for awhile. The Dodge is loud!The Dodge is awesomely huge! The Dodge motors along like it owns the road! I’d be surprised if we went as far as a mile but that one ride has to be the happiest car ride of my life. Part of it was just the sheer joy of riding along in this old, wonderful, car. And part of the happiness was looking over at my brother at the wheel. He looked so much at home there driving the Dodge. So proud. So happy. As for me, I felt pretty at home in the role of big sister going along for my first ride in the Dodge and pretty proud of my little brother. Because if it wasn’t for all of Joel’s hard work, the old dear wouldn’t be running at all. Love Love this story. Its amazing. I want to meet the Dodge.